Greetings and salutations, forex buddies! The pound has been losing demand due to a less-hawkish BOE, a string of not-too-optimistic reports, and more recently, the prevalence of risk aversion, especially in the European markets. But what about the big picture? Well, let’s take a look, shall we? The preliminary reading for Q3 2015 GDP printed a 0.5% quarter-on-quarter growth, which is a bit slower than Q2’s +0.7%. On an annualized basis, Q3 only expanded by 2.3%, which marks the second consecutive quarter of slowing annualized growth. According to the GDP report from the UK Office for National Statistics (ONS), the main driver for quarter-on-quarter GDP growth was the 0.7% expansion in the services industry, which had a positive contribution of 0.59% to GDP growth. The main drag was the 2.2% contraction in the construction industry, which subtracted 0.14% from GDP growth. 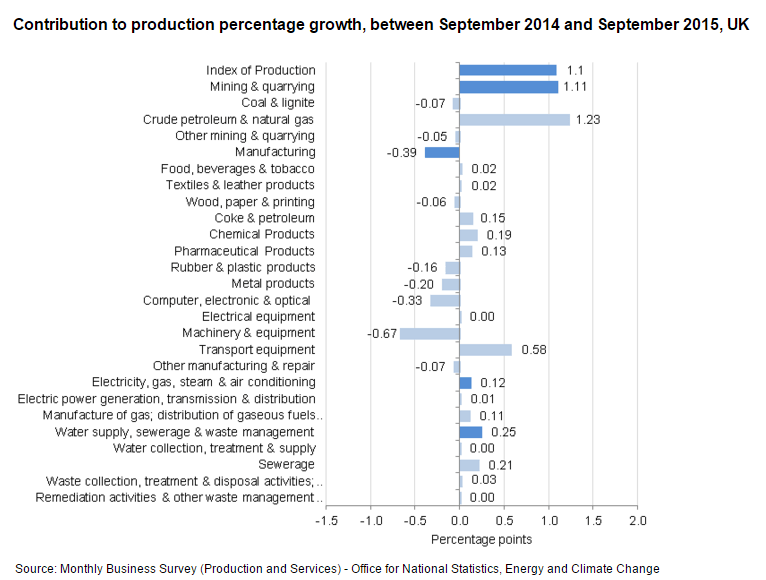 Meanwhile, industrial production grew by 0.3%, adding 0.04% to GDP growth. Manufacturing output fell by 0.3%, however, but total industrial output remained in the green due to a 2.4% increase in mining and quarrying output. Do note that this is only the preliminary estimate, so revisions are still a possibility. Also note that the second GDP estimate is set for release this Friday (Nov. 27, 9:30 am GMT), so make sure to mark your forex calendars for that. The latest jobs report from the ONS was painting a rather mixed picture. On one hand, the jobless rate for the July to September period ticked lower to 5.3% (5.4% previous), which is a seven-year low. Moreover, the employment rate edged higher to 73.7% (73.6% previous), which is the highest ever on record since records began in 1971. On the other hand, the claimant count change for October came in at 3.3K people seeking unemployment-related benefits, which is double the expected 1.6K and significantly higher than the 0.5K registered previously. And while wage growth looked somewhat decent on the surface since it increased by 3.0%, which is the same rate as last time, looking at the details of the reports tells a different story since the increase in wages was mostly due to a 15% increase in bonuses. 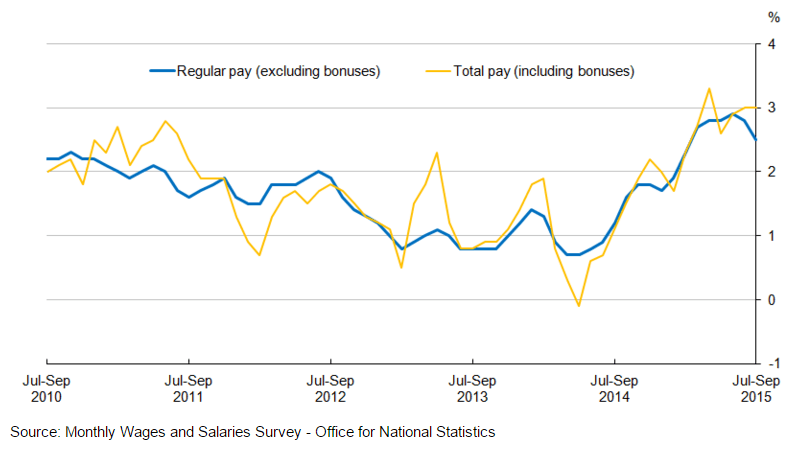 And if bonuses are excluded, we can see that wages only grew by 2.5%. Industrial production for the September period was down by 0.2% month-on-month (+0.9% previous), but up by 1.1% year-on-year (1.8% previous). The biggest driver for continued annualized growth was the mining sector while the biggest drag was the manufacturing sector, particularly the 13.7% drop in the manufacture of machinery and equipment, which subtracted 0.67% from total industrial output. As for the lower rate of annualized industrial production, that’s mostly due to a lower positive contribution from the mining & quarrying sector (+1.11%) when compared with the previous contribution (+2.22%). Looking forward, things look a little brighter, especially for the manufacturing sector, since Markit’s manufacturing PMI reading for October jumped from 51.8 to 55.5 due to accelerated output and new order growth. Markit’s services PMI for October is doing well as well, climbing to 54.9 from 53.3 mostly on employment levels strengthening to a five-month high. Retail sales volume in October contracted by 0.6% month-on-month (+1.7% previous) while the year-on-year reading only increased by 3.8% (+6.2% previous). Forex traders who have been reading my write-ups probably weren’t surprised when the actual readings came out, however, since I noted in my previous Monthly Economic Review for the UK that the surge in UK retail sales due to the Rugby World Cup was unsustainable and some normalization is therefore to be expected. In addition, I also highlighted in my Forex Trading Guide for this event that leading indicators were pointing to a possible downturn. Moving on, GfK’s consumer confidence index is still in positive territory, so Britons are still relatively upbeat. However, the reading for October ticked lower by one point to +2.0 points, with three of the five sub-indices seeing some drops. The “major purchase” index noticeably dropped to +7.0 points from +14.0 points previous. Britons are also losing confidence on what the future will bring since the “general economic situation over next 12 months” index further dropped by two points to -4.0 points. I already discussed this in my latest Global Inflation Roundup, but annualized headline inflation declined by 0.1% in October, same as back in September, due to negative contributions from the “food and non-alcoholic beverages” (-0.30% vs. -0.25% previous) and “transport” (-0.39% vs. -0.41% previous) components. This wasn’t really that much of a surprise to most forex traders, however since the BOE already warned that inflation is “likely to remain close to zero in the near term” in their MPC meeting minutes and November Inflation report. Still, the month-on-month reading was able to tick higher to +0.1% (-0.1% previous), though. Overall, the British economy is still doing relatively well when compared to most of the other advanced economies, aside from inflation levels, of course. Nevertheless, the British economy’s current performance only helps in convincing BOE officials that they should delay hiking rates, especially the relatively subdued readings for consumer spending (that jump in September retail sales was a fluke, I tell ya) despite growing real income due to increasing wages amidst low (and even negative) inflation rates. And that will probably keep on weighing down on the pound until the next data dump.